Even as skilled as their archers were, those from Middle Earth still sought to protect their arm from the unfortunate snap of a bowstring. And when you put on one of our Tree of Gondor Archers Arm Guards, you will feel just like a bowman from Gondor. This arm guard features a decorative white tree emblazoned across the surface of the leather. Decorative in its twists and curls, the tree bears no leaves or fruit, yet still comes off as incredibly beautiful thanks to its shape and shade. Sitting above the tree are seven stars, which angle upwards, three on each side and one at the very top-center. This functional arm guard is crafted from 7/8 oz. leather that is designed to take a blow and come back for more. Archers and LoTR fans, in particular, will find something to love about these bracers. It features speed lacers on the sides, which ensures that it can be pulled on quickly and easily, while still providing a great fit. As is typical for an archers bracer, it is designed to be worn on the inside of the arm. Please note that the bracer is sold individually, and not as a pair. 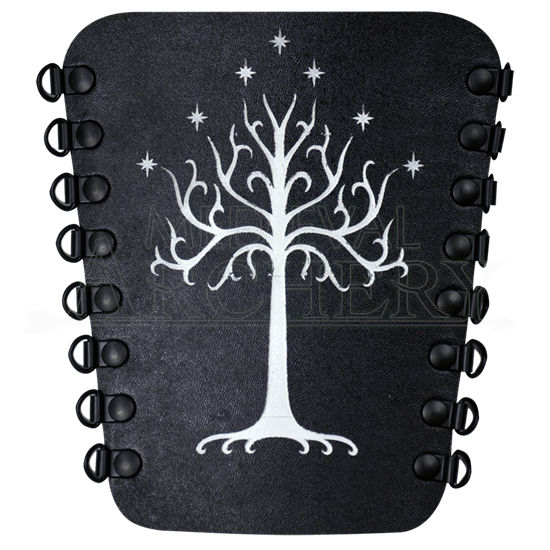 If you have got a Lord of the Rings Costume planned in the near future, then this arm guard will definitely help to accent its look, although that is not to say that this White Tree Archers Arm Guard is not a great choice for any archer who likes its look, because first and foremost, this is a bracer that excels at keeping your arms safe from the snap of a bowstring.